Pearl barley (sometimes called pearled barley) is the most common form of barley for human consumption because it cooks faster and is less chewy than other, less-processed forms of the grain such as “hulled barley” (or “barley groats”, also known as “pot barley” and “Scotch barley”). All barley must have its fibrous outer hull removed before it can be eaten; pearl barley is then polished to remove the bran layer. Because of its high caloric, protein, vitamin and mineral content this variation of tabbouleh is much more wholesome than the usual version made with bulgar. Place barley and cinnamon stick in a medium-sized saucepan, cover with water and bring to the boil over a medium heat. Simmer for 20-30 minutes until barley is cooked and tender. Drain then stir through lemon juice, half the olive oil and combined cumin and salt. Season with pepper. 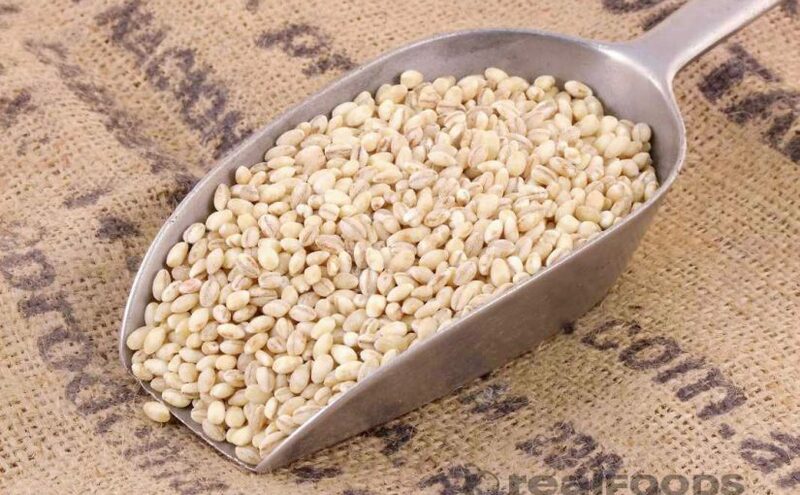 Combine barley mixture with herbs, rocket, onion, celery heart and leaves and almonds and season to taste. I’ve been experimenting with using different kinds of grains in my salads. Recently I came across one that used millet. I couldn’t find millet and thought that amaranth would produce a similar result. I was wrong. It’s more of a porridge grain and turned into a sticky mush. However, it did have an interesting nutty flavour. Like quinoa, amaranth is an ancient seed that was a staple of the Aztecs and Mayans, it’s full of calcium and anti-oxidants and packed with protein. I intend to experiment with it and find best uses – didn’t do the job for my salad and I ended up quickly cooking some couscous to mix in with it (which worked really well). 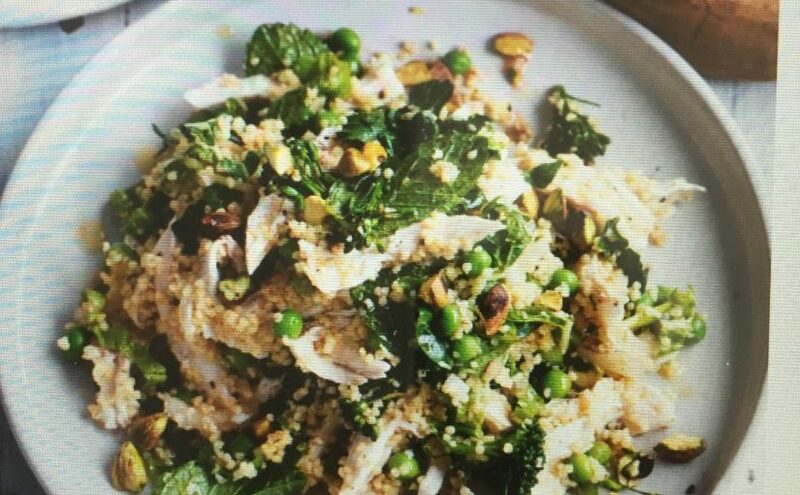 The beauty of this salad is that it’s quick to make and the only thing you need to cook is the chicken and the millet. Place chicken in a saucepan, cover with plenty of cold water, a spoonful of salt, handful of black peppercorns and some spring onions (optional) bring to a simmer and cook for 5 minutes. Turn off the heat, cover and let it stand to finish cooking. Dry roast millet in a saucepan over medium-high until nice and golden (2-3 minutes). Add stock, season to taste and baring to the boil. Cover, reduce heat to low and cook without uncovering for 15 minutes. Spread millet on a tray and refrigerate to cool. Meanwhile, drain chicken and tear it into pieces. Combine in a bowl with peak silver beet, broccolini and mint, then add millet and toss to combine. Shake the dressing ingredients in a jar to combine and drizzle over the salad. Toss to coat and serve with scattered pistachio nuts. I now find myself searching for more interesting interpretations of salads and while Ottolenghi has produced some very fine books with delicious vegetarian meals, I find a lot of them tend to be on the labour intensive end of the cooking spectrum. By the time I get home from yoga, I want something quick. Quick is also the key to shopping expeditions: I generally have 10 minutes before my yoga class to race into the shops to purchase my ingredients, so I can’t afford to have huge lists. Nor can I afford to aimlessly wander the aisles searching for inspiration (something that is at times a challenge in Noosa – the tale of my frustrating search for instant polenta being a case in point). So to this week’s eating. I have a bunch of kale in the fridge and some zucchini, brussel sprouts, cos lettuce, cucumber, coriander, mint, a pomegranate, a hot -smoked trout, haloumi, a jar of baby roasted peppers and in the cupboard: two potatoes, onions, preserved lemons, chick peas and a whole host of vinegars. In the garden: sage, rosemary, parsley, thyme, curry leaves, kaffir lime. What to make? 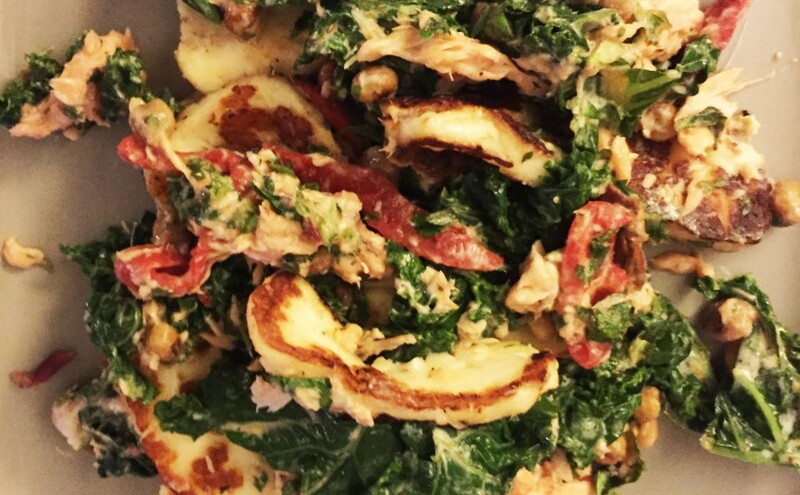 A kale and smoked trout salad with haloumi and roasted peppers. The other day I came across a recipe for a kale and smoked trout salad that looked very appetising but when I read through the list of ingredients it seemed that everything was thrown without consideration of how all the ingredients would actually taste together. Kale, smoked trout, haloumi, roasted chickpeas dressed in olive oil and smoked paprika, chimichurri (an Argentinian sauce traditionally used for bbq meats), pomegranate, yoghurt-tahini dressing, and poached eggs. Overkill? The maxim ‘less is more’ had clearly never been heard of, so while it looked good in the photo, I’m sure it would have tasted … well, how to politely put it: much like those piles of food that people heap on their plates at buffets. Lacking a flavour profile with too many conflicting tastes and textures. There are obviously many variations on this dish. You could just as easily use chick peas and haloumi (but omit the trout); or trout with poached eggs (omit the haloumi), or trout and pomegranate and maybe some lovely little tomatoes, but never ever, everything at once. As for the brussels sprouts – they’re for tomorrow’s meal. Oh, and there’s tofu too. I’m starting to get inspired.